Kids-Assisting Hand Assessment (Kids-AHA)1 measures how well children with hemiplegic, or unilateral cerebral palsy (affecting one side of the body) use their affected hand, when using both hands together during play. School-Kids AHA – for older children, aged six-years-old to 12-years-old. A version for infants aged from eight to 18 months old, called the Mini-AHA is also available. School-aged children – the child is invited to play one of two adventure-themed board games in the session. 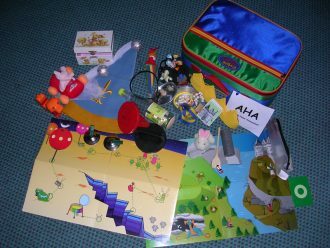 The same specially selected toys are used - but this time the toys are used as part of the board games. The goal remains the same – to provoke the child to play using two hands together. The child is videorecorded as they play. The therapist will later score their performance from the recording. The assessment session will take between 30 – 60 minutes and includes 15 minutes for the play-based Kids-AHA assessment1. It takes a further 60 minutes for a therapist to score the assessment from the videorecording. Feedback about the assessment can be written in a report or given verbally depending on family preference. A written report takes approximately 30 minutes to complete and a face to face feedback session also takes approximately 30 minutes. Fees will apply for a health professional to conduct the assessment. You should also check with your provider to confirm if there will be any additional costs to develop a home program, travel to the session/s or prepare reports. The cost will vary depending on the service provider. Health professionals must undertake training and certification in order to administer, score and interpret both versions of the Kids-AHA. For information on completing the training course, visit the Assisting Hand Assessment website or CPteaching™. There are costs for training and certification to become qualified in giving this assessment. As part of the course, a test manual is supplied. Assessment kits can also be purchased. A therapist scores the videorecording of each child’s performance on 20 items, according to a four-point scale1. The scale is specific for each item, but with a generic basis (that is, 4 = Effective to 1=Does not do). Scores are entered into an electronic spreadsheet, which calculates a raw score (20-80) and logit based AHA units (0-100). These are then used to interpret and report the results1. Kids-AHA was developed using Rasch measurement modelling as a standardised, criterion-referenced assessment to examine a child’s typical performance using both hands together - not their capacity2. What this means is that it assesses how children typically use their more affected upper limb in two-handed activities (performance) – and does not describe or measure their best ability (capacity). A hierarchy of difficulty of items was produced by the Rasch analysis. A child’s level on the hierarchy allows the therapist to gain a profile of their strengths and weaknesses. Their treatment can be designed to provide the “just right” level of challenge by targeting the movements and tasks which are more difficult. Responsiveness – evidence from Rasch analysis4 and changes in Kids-AHA scores when used to evaluate the effects of intervention in clinical research suggests the assessment is responsive to change6. Data for the standard error of measurement2 and smallest detectible difference5 is available to assist in identifying meaningful change after intervention for individual children. Krumlinde-Sundholm, L., Holmefur, M., & Eliasson, A. (2014). Manual: Assisting Hand Assessment – Kids, 18 months to 12 years, β-version 5.0, English. Stockholm: Karolinska Institutet. No access available. Holmefur, M., & Krumlinde-Sundholm L. (Early view, October 28 2015). Psychometric properties of a revised version of the Assisting Hand Assessment (Kids-AHA 5.0). Developmental Medicine and Child Neurology. Krumlinde-Sundholm, L., Holmefur, M., Kottorp, A., & Eliasson, A. C. (2007). The Assisting Hand Assessment: Current evidence of validity, reliability and responsiveness to change. Developmental Medicine and Child Neurology, 49, 259-264. Holmefur, M., Aarts, P., Hoare, B., & Krumlinde-Sundholm, L. (2009). Test-retest and alternate forms reliability of the Assisting Hand Assessment. Journal of Rehabilitation Medicine, 41, 886-891.